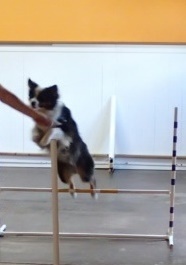 Dog agility classes have no size, breed, or age restrictions! It is a fun and energetic team sport and great exercise for dogs and owners. These are 6 week courses. Classes may not be consecutive weeks. Only $150. Our instructor, Emily, has over 12 years of experience in agility work with dogs, holds a degree in Zoology, and has competed in multiple levels of agility trials. Come on out and meet new people and bond with your dog while learning something fun and exciting! 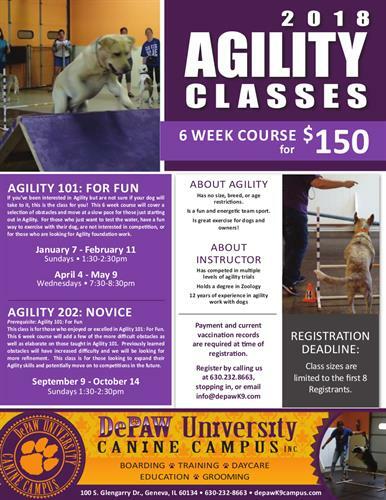 This class is for those who enjoyed or excelled in Agility 101. This course will add a few of the more difficult obstacles as well as elaborate on those taught in 101. This class if for those looking to expand their Agility skills and potentially move on to competition in the future. Call 630.232.8663, email: info@depawK9.com, or stop in to register. *** Space is limited to first 8 registrants ** Payment and vaccination records are required at the time of registration.